Engage Black announces the successful integration of the BlackVault Hardware Security Modules (HSMs) with Fornetix’s enterprise key management system Key Orchestration. This integration of products provides a comprehensive key life cycle solution, housed in hardware capable of withstanding and responding to any attempted breach. Time and again, perimeter network security has proven insufficient, with data breaches now targeting every layer of an organizations network. Key Orchestration paired with the BlackVault HSM, provides the scalability, automation, and ease-of-use organizations are looking for without sacrificing an inch of security. “Engage Black’s mission has been to provide standard setting information security to a wide audience of businesses and entities that have been left at risk in this modern era of cybersecurity. The Key Orchestration Appliance unlocks the potential of the Black Vault HSM to reach this audience, providing an avenue for businesses to seamlessly integrate security protocols into pre-existing environments and fully automate the key management life cycle,” said Mark Doyle, CEO of Engage Black. Key Orchestration has reached the pinnacle of interoperability due to its KMIP compliance, allowing for integration into pre-existing PKI infrastructure without the difficulty of establishing proprietary protocols. Companies can now employ top to bottom security for data at rest, data in motion and data currently in use without the need for extensive cryptographic expertise. In our present time, protecting your company’s data has never been more integral with the increasing frequency and complexity of cyber-attacks hitting even the most unsuspecting industries. Healthcare, First-Responders, utilities, PCI, CCTV, and an extensive list of others can secure not only their data but their IoT devices from outside threats and malicious attacks that could lead to disastrous consequences. Engage Black is the Cryptographic Appliance business unit of Engage Communication Inc. and focuses on providing advanced cryptographic products to both existing and emerging markets. The “Black” in our name refers to industry terminology for encrypted or cipher text information. Since 1989, Engage has developed innovative networking and telecommunication products that enable organizations across the globe deploy and operate cost-effective and reliable communications. Engage Black provides solutions that address the growing sophistication of cyber attackers, both within and outside of organizations, by securing and protecting cryptographic keys, data at rest, data in motion and device authentication. We’re an equal opportunity innovator; solving specific security problems for government, military, telecom, utility, enterprise, public safety, cloud services, developers, and PKI solution providers. Engage Black products are manufactured in America and supported Worldwide. Contact Engage at 1.877.ENGAGE4 / +1.831.688.1021 or email us at sales@engageblack.com for more information about the Engage Black business unit, BlackVault hardware security platform, or other members of the “Black” product lines. 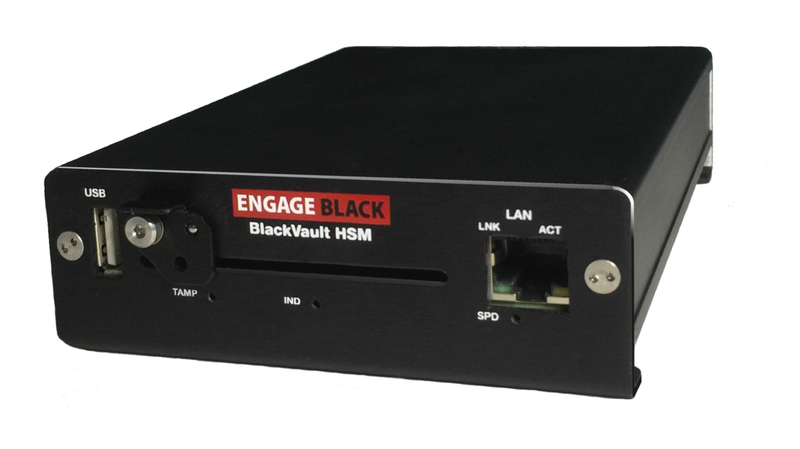 Engage Black expands the BlackVault Hardware Security Module product line with 2 additional Ethernet attached models: BlackVault HSM.RAS and BlackVault HSM.TAC that are remotely managed by the BVGUI, an intuitive menu driven application. M of N authentication and comprehensive key backup are employed for additional security. The BlackVault HSM.TAC targets the need for a military grade HSM that has: a compact form factor; smart card with cambered retention; and operating temperature range that fits within Tactically deployed communications kit requirements. NSA’s Commercial Solutions for Classified requires that the Certificate Authorities for Multi-layered VPNs utilizes an HSM. The BlackVault HSM.RAS is a cost reduced commercial version with an integrated Smart Card reader that utilizes an extruded aluminum case that has flanged end plates for securely mounting: within a 1U shelf/locking drawer; on DIN rail or wall mount. The RAS is priced very competitively for a FIPS 140-2 Level 3 HSM. Engage Black’s initial HSM offering, the BlackVault HSM.NAV, is managed via integrated Touch Screen and Smart Card reader. This approach has served the desktop and the stored root key HSM applications very well. The intuitive Menu driven Graphic Touch Screen interface of the BlackVault HSM.NAV was ported into the BVGUI application. The BlackVaults securely boot up into the prescribed application and once authenticated, is ready to go. It can also be used in HSM mode where it supports existing HSM applications using traditional APIs (PKCS#11, CAPI/CNG, JCE, etc. ), and can incorporate custom functionality. The BlackVault are the cryptographic appliances of Engage’s “Black” product line, which includes the BlackDoor (Ethernet Encryptors), BlackBond (Circuit Encryptors), and BlackTube (Circuit to Packet Encryptors) solutions. Engage Black products are produced in America and supported Worldwide. Please contact Engage at +1-877-ENGAGE4 or email us at sales@engageblack.com for more information about the Engage Black business unit, BlackVault hardware security platform, or other members of the “Black” product line. Engage Black, is the cryptographic business unit of Engage Inc. Founded in 1989, Engage enables organizations to connect, protect and secure their communication networks. Engage Black provides innovative cryptographic solutions that securely generate, use and manage cryptographic keys and material; and encrypt data in motion. CertAgent 7.0.6 is the only NSA CSfC approved CA with NIAP certification for compliance with the Common Criteria Protection Profile for Certification Authorities (v2.1). X.509 certificate issuance for individuals, routers, webservers, VPNs, and internet phones. RSA and NIST/NSA SUITE B-complaint ECC key types are supported. The BlackVault HSM is a FIPs 140-2 Level 3 network attached HSM module that performs: key generation and management, cryptographic operations for VPN network authentication, data encryption, regulatory compliance and critical security systems with support for PKCS#11, JAVA, and Microsoft CNG cryptographic APIs. For more information about the Engage BlackVault HSM and the BlackVault platform, contact Engage at +1.831.688.1021 or email sales@engageblack.com.